Then I saw my scribbled hand notes on the page, the unofficial name I had affectionately given this presentation as I researched, compiled my case studies and brought it into being, months prior and I instantly relaxed…oh…Kids’ Guts Are Mental…now that I have some serious experience with and something to say about! You see, when parents bring their children and adolescents with myriad behavioural problems, some quite extreme, some psychiatrically assessed and prescribed for, I take a good look around their whole picture, just like I do in patients of any age, asking myself, ‘What could be contributing‘ or, ‘What else could it be?’ Kids’ digestive systems can add an extra dimension of difficulty because they can’t always articulate what’s going on, so you need extra sleuthing skills and, in my humble opinion, you, really need to be able to pick up on the clues in their pathology results and a whole other world opens up. Surprisingly often, a gut problem becomes apparent…and it could be anything: undiagnosed coeliac, severe constipation, diarrhoea from food reactions, parasites and yes worms (Oh you are not going to believe it til you hear it!) and these ongoing chronic issues, often unknown largely to mum and dad, become a major driver of mood, cognitive and behavioural issues. I’ve seen it enough times to know. And it can present on the surface in the form of oppositional behaviours, anger, mood volatility, poor concentration, self-harm, nightmares, depression and oh yes, buckets of anxiety. The whole story of course is almost always multi-factorial. There is still often also a case to answer for their diets, lifestyles, parenting, trauma, suboptimal nutrition and a complete deficiency of ye-olde-get-your-knees-dirty-like-a-real-kid activities & experiences! When paediatric patients present with anger management issues, neurocognitive abnormalities, labile moods or even anxiety, there is a long line-up of likely suspects on whom to pin the blame. Excessive screen time, erosion of community, lack of natural sunlight and adequate outdoor exercise, crappy diets and inadequate sleep are some that quickly come to mind but are we adequately considering and exploring the possibility of gut driven mood issues in kids? 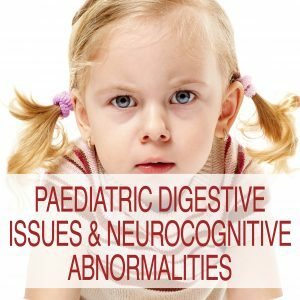 Paediatric Digestive Issues & Neurocognitive Abnormalities, reviews the key neurobehavioural manifestations of a variety of common paediatric digestive issues and introduce you to a few of her favourite paediatric patients that taught her all this (! ), along the way. Product available as streaming audio visual with pdf notes.